Are you ready to vacation in Mexico? If so, get ready for adventures in the sun, great tasting food, and plenty of interesting culture and history! Ancient pyramids, eclectic shopping, exciting sports (like river rafting), beautiful beaches, and much more await you in this special country. There is a reason Mexico vacation rentals are so popular; read on to find out why. There is not much that Mexico does not offer vacationers. Those who want to learn about the country is fascinating Aztec roots will be thrilled by all the ruins and museums to explore. Those who want to learn about the country is culture will love getting to know the Mexican people. And of course, those who simply want to lie out on the beach all day and bar hop at night will be just as pleased. Families, groups of friends, and couples of all ages vacation to Mexico every year. That is because the country has so much to offer! Romantic destinations like Acapulco, tropical paradises like Cancun, and unique cities like San Miguel de Allende draw in tourists from all over the world. However, if you do not consider a Mexico villa rental or vacation home, you are limiting your experience. 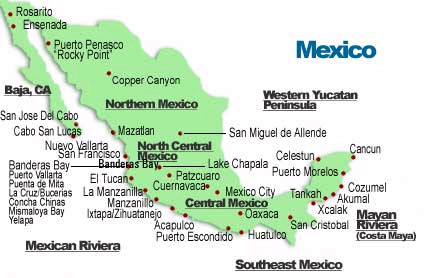 In order to fully absorb the local flavor of each town and city in Mexico, do not stay in a typical resort hotel. Instead, consider Mexico vacation rentals. When planning your itinerary, choose from attractions like the La Isla Roqueta y el Zoo, The Ruinas del Rey, the National Institute of Anthropology and History, Playa del Carmen beach, Iglesia de San Agustin, the Catedral Metropolitana, the Acuario de Veracruz, and much, much more. What are you waiting for? There’s a Mexico villa rental with your name on it! You can vacation in Mexico easily, affordably, and comfortably, thanks to your many lodging choices!